If you have been researching the perfect tablet to give to a loved one this holiday season, you’ve probably read a lot about display quality. Tablet display size, resolution and aspect ratio have been discussed at length this year, which is really no surprise, since the quality of the display has the biggest impact on how we enjoy content on these devices. What is surprising though is that color performance, one of the biggest differentiators among the current crop of tablet displays, has been largely glossed over by the mainstream gadget press. Color is being ignored in spite of the fact that there are tremendous differences in the color performance of each of these devices that directly impact the consumer experience on each. So why are we overlooking a feature that, unlike many of the features we focus on these days, presents a real difference between devices? I see a couple reasons. First and foremost, thanks to Apple’s marketing of the Retina display, pixels-per-inch has become the spec du jour in today’s device wars. Device makers are focusing their marketing efforts on pixel count above anything else. Aside from current trends, I believe there’s also a macro reason to why color has been left out: color performance is just hard to compare. There is no universally accepted spec that can sum up color performance across devices. 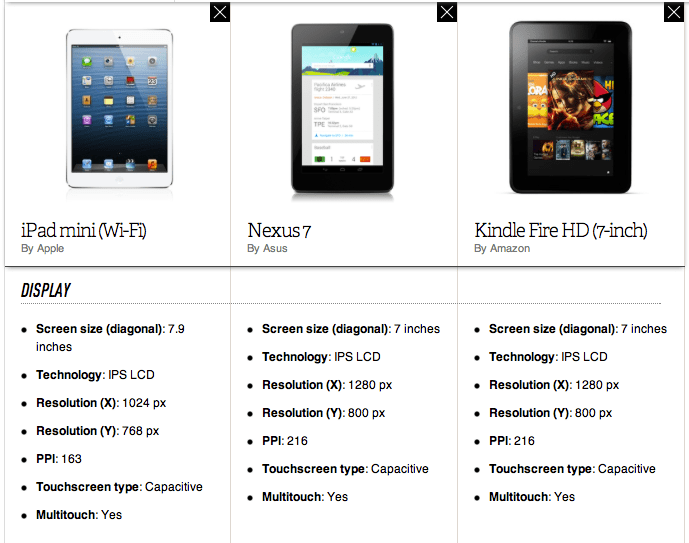 From this information, a shopper could gather that the Nexus 7 and Kindle Fire HD have about the same color performance and both outdo the iPad mini. That is an accurate assessment, but it’s not the whole story. If we look at those color gamuts plotted in CIE 1976, some important nuances become apparent. 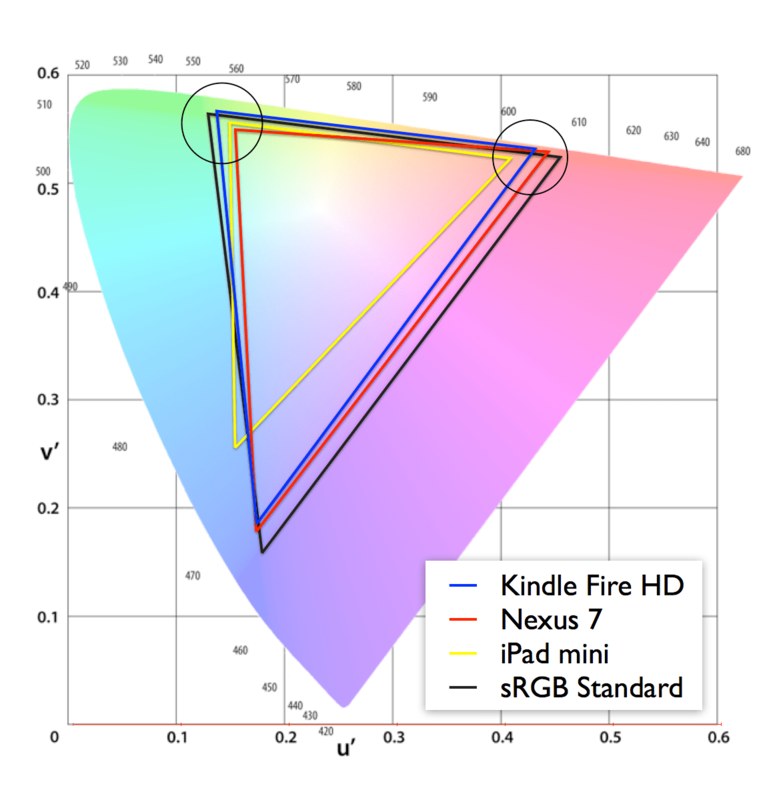 By measuring the percent of sRGB, we know how much of that overall color standard the device can reproduce. However, displays usually produce more of one color than another and that information is completely lost with this measurement. The Nexus and Kindle have significantly deeper blue than the iPad mini, most likely due to a narrower blue color filter like the one found in the third and fourth generation iPad. This accounts for most of the difference in sRGB coverage between the iPad mini and the other two devices. Take a look at the other two primaries and it gets more interesting. In the image on the right that zooms in on green, we see that the Kindle Fire has the deepest green of the three, followed by the iPad mini and the Nexus. For reds, though, it’s different again, with the Nexus having the deepest reds followed by Kindle and then iPad. If we ever want to make color performance a real differentiator in consumer choice, we need to develop a new universal standard to easily compare color across devices, taking into account all of these nuances. Color is a complex story to tell, but small differences in color performance are just as noticeable to consumers as pixel density in everyday use. Next time you find yourself at a retailer who carries all three devices, try googling test patterns and look at the differences. You might be surprised.